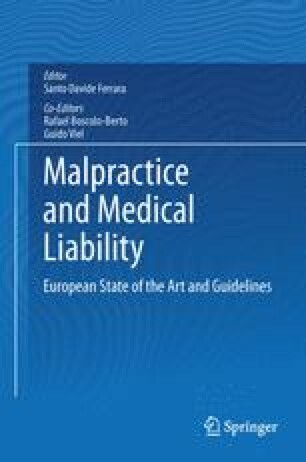 The first section of this chapter introduces the issue of medical liability in France, while the second one examines the epidemiological data within the same context. The third section looks at juridical procedures in penal jurisdictions, civil jurisdictions and administrative jurisdictions. Subsequently, non-juridical procedures intervening in medical responsibility are examined, looking at the Council of the Order of Medical Doctors and the Commission régionale de conciliation et d’indemnisation des accidents medicaux (CRCI). The sixth section of this chapter examines the nomination of experts in cases of medical responsibility, while the seventh deals with expert examination of living persons and cadavers. The penultimate section looks at the evaluation criteria for medical error/inobservances in France. This chapter concludes with present and future prospects concerning the issue of medical responsibility in France.